The Salinas Valley is home to a rich and complex heritage, one interwoven with ancient Pueblo culture and early Spanish colonization of what is now the State of New Mexico. The stark ruins of Abó Pueblo and Mission reflect its layers of history. Spanish missionaries came to occupy Abó Pueblo, the home of the Tompiro American Indian people in the 17th century. The Spanish built the San Gregorio de Abó Church there in the late 1620s and abandoned it in the early 1670s. Today, roughly 40 percent of the original Pueblo buildings remain as ruins – many still unexcavated and likely containing important archeological information about the ancient peoples of the valley. Skeletal red sandstone walls of the San Gregorio de Abó Church stand as reminders of the Spanish and Catholic influence in the American Southwest. Abó is a National Historic Landmark and a part of the Salinas Pueblo Missions National Monument, which is also featured in this itinerary here. In addition to Abó, the monument includes the pueblos of Gran Quivira and Quarai and their associated Spanish missions: La Purisma Conception de Cuarac, San Buenaventura, and San Isidro. A visit to Abó is important in understanding the intense intersection between the American Indians and Spanish cultures in 17th century New Mexico. The Salinas Valley is believed to have been occupied as early as the 10th century by the Mogollon and, later, Anasazi people. The area was an important location for trade between tribes of the Rio Grande and those on the Western Plains. Pueblo ruins at Abó date to around 1300, a time of great prosperity and cultural growth for the valley people. Mogollon and Anasazi traditions blended to form the Tompiro culture. The Tompiro were skilled as craftspeople, hunters, and builders, and in their agricultural practices. At its height, Abó Pueblo must have been an impressive, bustling community. The Spanish first arrived in New Mexico in 1540 when explorer Francisco Vasquez de Coronado led an expedition in search of the rumored seven cities of gold. He found, instead, intricate pueblo communities and the talented, economically sophisticated people who occupied them. This initial expedition inspired further forays into the area. 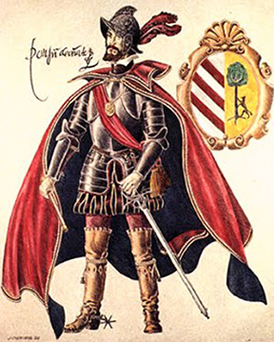 In 1598, Juan de Oñate encountered the Salinas Valley and the large Pueblo societies at Abó, Quarai, and Gran Quivira. The Spanish soon established permanent settlements there recognizing the Salinas Valley as central to lucrative resources and trade routes. Tensions quickly arose between the Indians and the Spanish government, whose activities ended up exploiting the Tompiro people. When the Spanish reached New Mexico in the 16th century, the descendants of the Anasazi and Mogollon Indians had already evolved into one of the most advanced and economically powerful cultures in the American Southwest. The Pueblo Indians, who had perfected their craft making and agricultural and hunting techniques, commanded the Indian trade paths with their abundance of goods. Because of their superior architectural skills, their impressive stone-and-adobe homes dominated the southwestern landscape. The Spanish found the Pueblo pottery, farming, and building techniques impressive, and recognizing the value of the American Indians’ skilled labor, they developed the encomienda system, which eventually led to the exploitation of the Pueblo peoples. Through the encomienda, the governor appointed ranking Spanish citizens to protect, educate, and civilize a group of Indians. In return, the Spanish collected tribute in the form of labor, food, and material goods. Eventually the Spanish began abusing the system, and tensions grew as Franciscan friars attempted to help the Pueblo peoples. The church was powerless against the government, and the lucrative system continued. Conflict also grew from the religious pressure that Franciscan friars placed on the American Indians. The clash of religions made it difficult for the missionaries to convert Pueblo peoples unwilling to give up sacred customs, which the Indians believed brought good fortune to their communities. The Franciscans attempted to stop the Pueblo people from performing these customs by informing the Indians that their people’s salvation depended on their conversion to Christianity. Spanish missionaries worked to bring Catholicism to the approximately 1,500 natives living at Abó Pueblo. Fray Francisco Fonte established Mission San Gregorio de Abó around 1621. By 1629, the large San Gregorio de Abó Church was complete. Built of red sandstone, the church made use of a European-style buttress system that allowed the building to have notably tall, thin walls. The church building was very different from the existing low, adobe structures in the pueblo at the time. 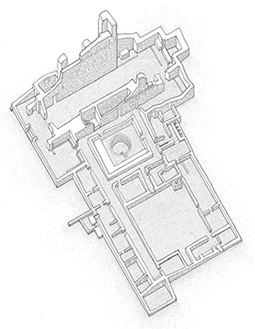 This drawing shows the visible ruins of the the San Gregorio de Abó Mission Church and helps describe how the interior space was originally laid out. Franciscan missionaries not only brought new religious ideas to the area, but also introduced the people of Abó to new species of domestic animals and plants, different agricultural practices, and Spanish goods. While the Franciscans likely had good intensions for the people of Abó, eventually the clash of cultures led to the failure of the San Gregorio de Abó Mission. Many Tompiro people refused to give up their sacred customs for new Catholic beliefs, especially when a series of draughts, epidemics, and Apache attacks hit the Pueblo starting in the mid 1600s, providing proof to many that Catholicism insulted their Tompiro gods. By 1672, the Abó Pueblo and its associated mission had only about 500 residents remaining of what had been a much larger thriving community. Native inhabitants who abandoned Abó are believed to have joined their Piro-speaking relatives along the Rio Grande. In 1678, the pueblo was entirely unoccupied. Abó sat empty and in ruins for centuries. Major excavation and stabilization occurred when the site became a New Mexico State Historic Monument in the 1930’s. 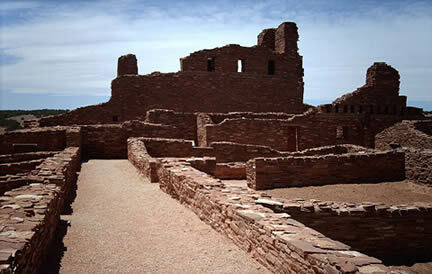 In 1962, Abó was designated a National Historic Landmark and in 1980, the ruins became part of the Salinas Pueblo Missions National Monument, which the National Park Service administers. The Mission San Gregorio de Abó Church is noteworthy as the only extant example of a thin-walled, buttressed, 17th century New Mexican church. It is also one of the earliest Spanish ruins in the Southwest. Access to the site of the ruins and the pueblo is through the Salinas Pueblo Missions National Monument, which offers interpreted tours and self-guided walks through the ruins of Abó, Quarai, and Gran Quivira. Recent stabilization efforts have made it possible for visitors to walk directly around and within the old walls of the Abó mission church and explore the largely unexcavated Pueblo remains. The National Park Service provides a trail map online here. Abó is a National Historic Landmark and part of the Salinas Pueblo Missions National Monument, a unit of the National Park System, located 10 miles west of Mountainair off Route 60 in Torrance County, NM. Click here for the Abó Pueblo and Mission National Historic Landmark file: text and photos. The main visitor center for Salinas Pueblo Missions National Monument is located on the corner of Ripley and Broadway Sts. in Mountainair. The center is open year-round from 8:00am to 5:00pm except for Thanksgiving, Christmas and New Year's days. The Abó site is open daily from 9:00am to 6:00pm during the summer (Memorial Day - Labor Day) and from 9:00am to 5:00pm during the rest of the year. Admission is free at all times. For more information, visit the National Park Service Salinas Pueblo Missions National Monument website or call 505-847-2585. The Mission of San Gregorio de Abó has been documented by the National Park Service’s Historic American Buildings Survey. Salinas Pueblo Missions National Monument is featured in the National Park Service American Southwest Travel Itinerary and Places Reflecting America's Diverse Cultures: Explore their Stories in the National Park System Travel Itinerary.